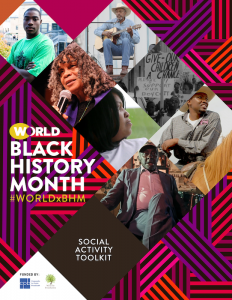 In partnership with WORLD Channel and in honor of Black History Month, Impact Media Partners (IMP) is proud to present a social activity toolkit for educators, community groups and public television lovers to use in concert with a month-long feature of stories by and about Black people. Additionally, IMP is partnering with several local public television stations to host community screenings of selections from the WORLD Channel x Black History Month programming. Throughout the month of February, WORLD Channel presents a diverse showcase of over 50 programs including premieres from AfroPoP: The Ultimate Cultural Exchange, Finding Your Roots, Independent Lens, and WORLD exclusive series America ReFramed and Local, USA. WORLD Channel invites you to watch and discuss the films and the issues during Black History Month using the hashtag #WORLDxBHM.